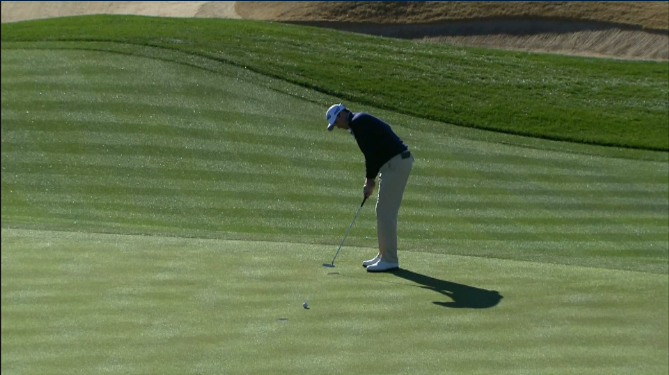 Michael Thompson watches his birdie putt on hole #13 during the fourth round of the Waste Management Phoenix Open. Michael Thompson saved his best round at the Waste Management Phoenix Open for Sunday's final round. He shot a four under par 67 and moved up 21 spots into a tie for 19th. The top 20 finish moves Michael up to 74th on the FedexCup points list. The fourth round proved to be the highest scoring round of the tournament with many pins being tucked into tight corners of the greens. Michael managed to score well despite the harder pin placements because his putter got hot. For the day he was +2.816 in strokes gained putting. Michael will be playing next week at the ATT&T Pebble Beach Pro Am on the Monterey Peninsula in central California. There aren't many more spectacular vistas in golf than three courses used for AT&T: Pebble Beach Golf Links, Spyglass Hill Golf Club, and the Monterey Peninsula CC’s Shore course.